Take the WEST N.W. 36 ST. exit. Turn LEFT onto NW 87TH AVE / GALLOWAY RD. Turn RIGHT onto NW 21ST TER. Turn LEFT onto NW 88TH CT. Turn RIGHT onto NW20TH ST.
Head WEST on NW 20TH ST toward PERMETERE RD. Turn LEFT onto PERIMETERE RD. 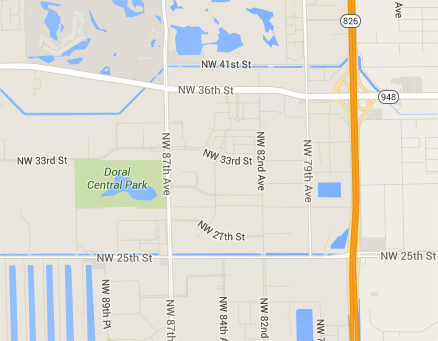 Turn RIGHT onto NW 45TH AVE.
Take the NW 12TH ST exit toward ND 87TH AVE NORTH. Turn LEFT onto NW 12TH ST. Turn RIGHT onto NW 20TH ST. Merge onto FL-836 W via EXIT 3A on the LEFT toward AIRPORT / U M / JACKSON MEDICAL CENTER. Take the NW 12TH ST exit toward NW 87TH AVE NORTH.